The Icom 7300 transmit bandwidth,TBW, has customizable settings. Sometimes it’s called the transmit filter width, not to be mistaken with the receive filter width. Have you changed your TBW to the best values? If they haven’t been tweaked, see how in this article and included video. I don’t have audio samples, sorry. The 7300 isn’t the only Icom radio with this feature, my Icom 7000 also has adjustable transmit filter widths. It’s common in modern ham radio transceivers. Do not confuse transmit filter width with receive filter width. Another friend of mine, Andy, WB0OAF, reminded me that these are confused at times. The receive filter width (not pictured) on the Icom 7300 is set using the FIL “soft button” on the LCD screen. Tap the FIL with your finger and you will see it change from FIL to FIL2 and then FIL3. 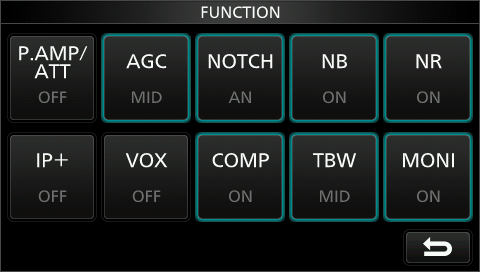 These filter widths are adjustable also, but that’s another story. The transmit filter widths are set using the FUNCTION, “hard button”, on the front of the Icom 7300. Push the FUNCTION button and a menu pops up (pictured above). You’ll see TBW. 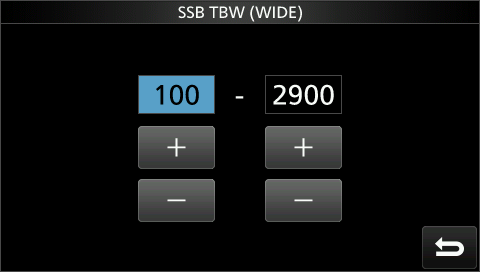 Tap TBW with your finger on the LCD and it will change from WIDE to MID and then NAR. Look at the Icom 7300 Full Manual on page 4-14. The full manual can be downloaded from here. Look at the Icom 7300 Full Manual on page 12-3. It is possible to set the transmission pass bandwidth of wide, mid, or narrow, by changing the lower and higher cutoff frequencies. Push the MENU button on the front of the Icom 7300. Tap SET with your finger on the LCD. Scroll to find the “Tone Control”. Tap Tone Control and then tap TX with your finger. Tap SSB. Use the scroll up and down arrows on the right of the LCD screen to scroll up to page 1/2 (pictured above). 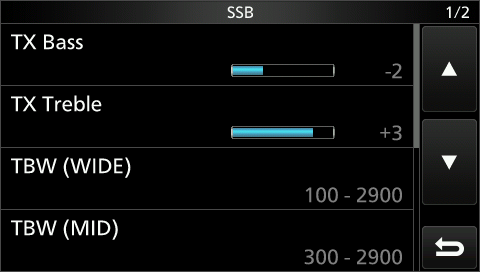 In addition to TBW settings you can also adjust the TX Bass and TX Treble on this screen. How do we listen to the transmit audio? Great question! Using the Monitor on the Icom 7300 we can hear what it sounds like. Hook up your headset to listen. Using the Monitor function isn’t really what your transmit audio sounds like on the air though, but it’s good enough most of the time. If you really want to hear what your audio sounds like, have another Ham record and send the audio file to you. That’s the best way that I’ve found. Included in this video: Demonstration of receive filter, transmit filter and customizing the transmit bandwidth. Also, suggestions for listening to your real transmit audio. Something new is learned every day, so many things that the 7300 has. Thank you so much Edmundo for coming by and commenting.